British luthier Andrew Guyton recently fully restored Brian's very first Egmond acoustic guitar, from its rather battered condition. Brian was so happy with the job that he agreed to allow Andrew to produce a limited edition run of Red Special copies. These will be very special guitars indeed. Just fifty copies will be made, forty in red to celebrate 40 years of the Red Special and ten in green. 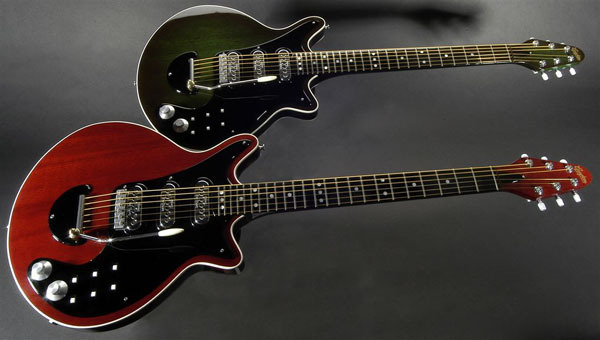 These will be the most accurate commercially available copies of the Red Special ever made. A choice of fretwire grades will be available according to the buyer's preference and the guitars will be supplied with a luxury fitted case, Fryer treble booster and photographic record of the guitar throughout the construction. These really will be the ultimate in Red Special copies and this kind of quality does not come cheap. Andrew estimates the cost will be in the region of £6500 - £7000. He has now completed the first two prototypes which Brian has tested against his original Red Special. The pictures below show these prototypes - and they look stunning. Many thanks to Andrew for giving permission to show these pictures. Watch this space for more information as it becomes available! Mondo Guitars have recently interviewed Andrew Guyton and discussed the Brian May project with him at length. The article also features more pics of Andrew's superb guitars. Mondo interview.